Study Abroad in the Fall with FOFAC! GW student Alan Ibarra was awarded the Fund for Education Abroad DC-Area Scholarship for the 2019-20 academic year. GW student and study abroad alum Elena Mieszczanski was chosen to present undergraduate research at the 2019 Notre Dame Human Development Conference. Scholarship and Financial Aid applications opened on Friday, February 15, 2019 -- Apply today! The Fund for Education Abroad (FEA) received a pledge of $90,000 from NAFSA: Association of International Educators to fund scholarships for African American undergraduate students to study abroad. GW's Office for Study Abroad recognized by the U.S. State Department as a top producer of Gilman Scholars. Nearly 100 students obtained passports this week as part of GW's 2017 Passport Caravan event sponsored by CIEE and hosted by the Office for Study Abroad. FOFAC members benefit from privileged early registration for spring courses, tuition awards and scholarships, housing opportunities, and many cultural and professional events in the spring semester upon returning to GW. 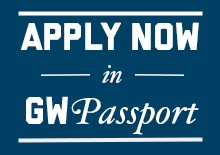 Students planning to study abroad during the Spring 2018 term can apply for GW scholarships online until December 1st. The GW Office for Study Abroad would like to congratulate the 15 students recently awarded the Critical Language Scholarship (CLS) by the U.S. State Department.